Marionberries, a product of Washington state and not of Washington DC. Had a nice visit last night with the folks in lovely Garden Valley about an hour’s drive north of Boise at the confluence of the Middle Fork and Payette Rivers. In response to an invitation from the Chamber of Commerce, I gave a short presentation about the solar eclipse at the Crouch Community Hall. The presentation I gave is posted below. Folks were really engaged and interested, and I was impressed by how thoughtful and forward-thinking everyone was when it came to logistics and planning for the eclipse. The Idaho Board of Tourism expects lots of people to come to Idaho, many of whom will visit or at least pass through Garden Valley, so being prepared for August 21 is key, especially for municipalities with limited resources. After the talk, my hosts invited me to dinner at the Two Rivers Grill, where we enjoyed a pretty amazing cobbler made from marionberries, a berry I’ve only encountered after moving to the Pacific Northwest. 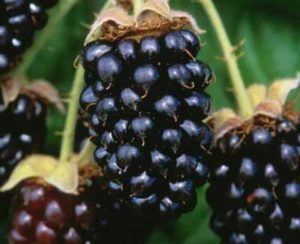 At dinner, my hosts explained that the marionberry was developed by Oregon State University via crossbreeding between a smaller, flavorful Chehalem blackberry and a larger, better-producing Olallie blackberry in the mid-1950s.